Row #1: 5 minutes, 31.5 SPM [strokes/rows per minute], 2:37/500m [2:37 minutes every 500 meters], 910 meters, 150 rows. Spending too much time doing one thing instead of another can lead to a general sense of lopsidedness. I prioritize rowing in my day because otherwise, though it would be nicer to have more time to write, I wouldn’t be able to dispel this physical energy very well. Row #2: 5 minutes, 38.5 SPM, 1:55min/500m, 1023 meters, 183 rows. Good set, good sweat. Maybe not as many strokes as I would like, but I hit a comfortable pace and got over 1000 meters. Accepting that we’re not perfect beings is the first step toward approaching perfection, somewhat. The rest is hard work, focus, and discipline. Row #1: 4:47 minutes, 33 SPM, 2:20min/500m, 930 meters, 150 rows. I let the elation of finishing a short story and anxiety of dealing with certain neurotica get the better of me, revving up my pace too fast this morning. My right leg was restless last night, so I need to take it easier physically and mentally to maintain my pace. Row #1: 4:42 minutes, 30.5 SPM, 2:28min/500m, 882 meters, 150 rows. Tempering my pace this morning by not focusing on hefty writing topics, leaving enough time to watch some stuff, and wrapping that up early gave me the padding time to feel comfortable with going at a lighter rowing pace, focusing on breathing technique over power. Row #2: 5 minutes, 37.5 SPM, 2:35min/500m, 941 meters, 187 rows. The return of that heat that just wears you down. Row #1: 4:25 minutes, 35 SPM, 2:40min/500m, 865 meters, 150 rows. Woke up feeling terrible. I have today and tomorrow off, so, of course, I pushed myself too far yesterday. It’s how it goes. 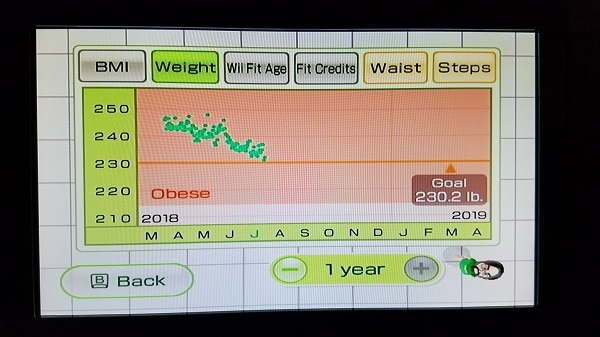 I wanted to go further at first, but just as I was approaching 150, I reached my limit. I feel sad that I can’t expand past this 5min limit. Row #2: 5 minutes, 43.5 SPM, 2:23min/500m, 951 meters, 200 rows. Kept a more solid pace than I thought. I’ve felt sick all day. After the first gallon and a half of iced water, I started to feel more like my normal self, though I’m still not there yet. To push myself even further because of opportunity and go out, or to rest up? Bonus: 30 minutes of yard work and cleaning. Row #1: 5 minutes, 36 SPM, 2:17min/500m, 982 meters, 189 rows. Decided to stay home last night, sleep in, and be lazy today. Didn’t feel as great as it sounded, but when is foregoing personal responsibility or growth worthwhile, except when you really don’t feel like it? If I had gone, would life be different today? Probably. Row #2: 5 minutes, 35.5 SPM, 1:57min/500m, 1065 meters, 165 rows. It’s fascinating how each 5-minute set is just a little different. This set was seemingly just about keeping a good rhythm, which resulted in good stats in all categories, but nothing outstanding in any section. Over 1000 meters but only a modest stroke per minute. Bonus: 30 minutes of light organizing. Row #1: 5 minutes, 26.5 SPM, 3:08min/500m, 740 meters, 122 rows. I wanted to focus on slow, deliberate rowing for this set in particular particularly inspired by Ron [friend and frequent commenter on Twitter] and also because it’ll be a long day today without much sleep. I did deep crouches and I could feel it in my knees, but it felt good rather than painful. Row #2: 5 minutes, 33 SPM, 2:50min/500m, 866 meters, 171 rows. It took me about 30 listless minutes scrolling through Twitter to work up the motivation to work out. Ugh. Bonus: 15 minutes of city walking. Row #1: 5 minutes, 32 SPM, 2:42min/500m, 880 meters, 156 rows. All I want to do today is sleep. It’s difficult getting out of ruts like that. So I write inconsequential things to take my mind off the fatigue until I’m ready to row/go. That distraction works out well. I just have to tell the screaming neighbors to quiet sooner. Row #2: 5 minutes, 37 SPM, 2:11min/500m, 1033 meters, 178 rows. It is hot, I’m sticky with the lingering sweat of non-air conditioned environments, yet through sheer force, I am feeling better. Hopefully, the neighbor kids won’t scream playfully when everyone should be asleep or quiet so I can get in some good rest. That’ll help. Bonus: 30 minutes of cleaning. – Oops. I was tired most of Tuesday, so in the afternoon, I just through a cloud of fatigue got home, checked in on Wii Fit, rowed, took care of some ants that were swarming the place, and went to bed. My current check-and-balance system isn’t working so well for vitamins. – Another miss on Wednesday night. It’s interesting to notice how my health directly correlates with my ability to remember basic functions: if I forget my vitamins, it’s a symptom of some larger fault, here being an overload of stress and stimulation. It’s not fun. It’s just a matter of endurance. 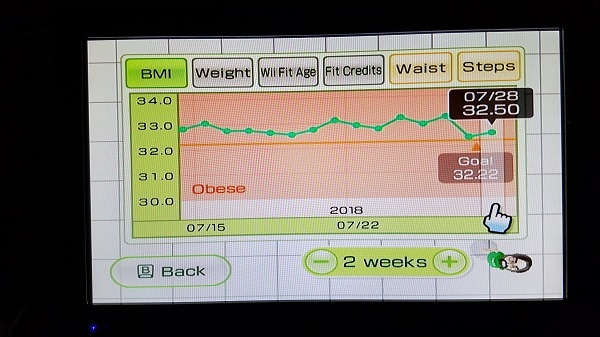 Weight [231.0 pounds]: [succeeded] Close call, honestly. I wasn’t keeping my overeating in check as much as I could have, allowing my hunger to act more like an addiction than being able to self-control my hunger. I need to figure out ways to taper that addictive hunger. Maybe through small snacks throughout the day? Consistency: [neutral] Even excluding the extra stuff, like push-ups and stationary jogs, I’ve been taking it easy the past week. Some of it is because it’s been really stressful at work, but that’s the thing: mentally hot should be met with physically hot to cool down both, otherwise, both can easily overheat. Health: [neutral] The best thing I’ve been doing for my health is drinking more than my one gallon of water daily minimum. More than one day this week, I didn’t feel well (mainly because of this oppressive heat) until after a gallon and a half of water. Still, I could eat better. Weight: No weight gain. 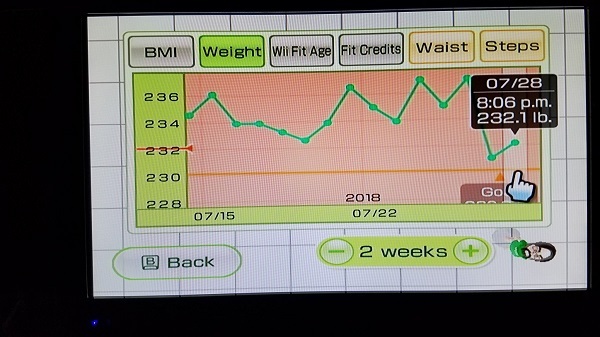 It’s a crapshoot right now with measuring my weight in Wii Fit, which is the best way to figure out that I’m gaining weight, but much of it has to do with stress. The more stressed out I am, the less interested I am in being disciplined. Consistency: I don’t do push-ups or stationary jogs simply because I don’t have a good space to do either one politely. Maybe I should do push-ups at work and maybe incorporate to doing stationary jogs as a warm-up before I row? I just need to decide that I want to start. Health: I’m not sure I’m quite ready for a two gallon of water per day minimum, but I’m certainly aiming higher when I can, just like with my fitness and nutrition. I’m in the transition period away from eating non-nourishing foods, so it’s just a matter of buying better quality food. I should do more. It’s just when I get discouraged, I hole away to rot, rather than do what I can to feel better quicker, be it eat something nourishing, exercise, drink water, or anything. It’s a hard mentality to break, so I should learn to identify that discouragement sooner. As I’ve shifted my waking schedule to have most of my free time before heading to work, I’ve noticed an increase in productivity, but as well an increase in fatigue. Fortunately, I am trying to get to bed sooner, so I’m not burning the candle at both ends… that often. Stress lingers in my mind for too long. I need to work on this, which is one of the primary reasons why I haven’t tried to advertise myself more. I need to work on my resilience, self-confidence, self-respect, and more first before introducing myself and my works to wider audiences. I’ve made significant progress in clearing out some unnecessary clutter. The biggest problem with collecting is curating, and with my scattered, unorganized collections, focus. I’ll focus on my videogame collections, specifically cataloging, organizing, and on this pass, focusing on selling off the duplicates or games I no longer want physically. On that previous note about stress, I am capable of suppressing emotions to accomplish important tasks. It’s just (and I don’t know why or how) that lingering anxiety if not dispelled properly exhibits randomly elsewhere. That’s why I try to confront those stressors directly. They won’t linger if addressed properly. I had four days off, which I was going to spend plowing through a bunch of work. Instead, I did what I think I was subconsciously thinking and chilled. That helped me bounce back into some work I’ve been wanting to do for a while, so I’ll just pace myself. – Above: I’m organizing my videogame collections, starting with NES. 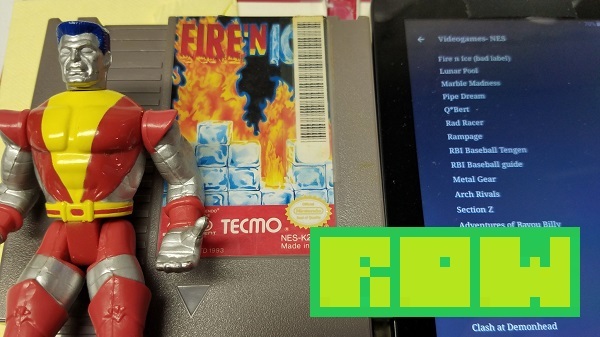 The Fire ‘n Ice cartridge (left) came to mind as I was typing up the list (right) in the Writer Plus app on my tablet. – Below: While I was taking the photos below, I wanted to see what my progress was, and since I’ve made it off that plateau, I figured that’d make an easy photo.